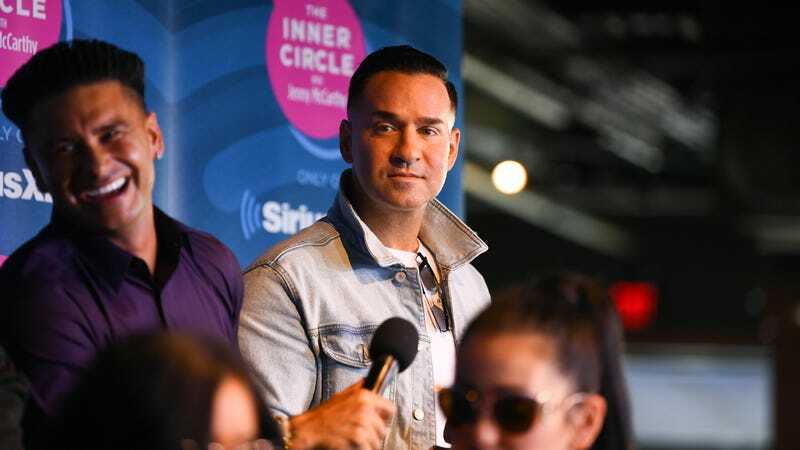 Proving yet again that nothing is truly sacred—not even the holy trinity of gym, tan, laundry—we regret to inform you that Mike “The Situation” Sorrentino is about to no longer enjoy the freedoms of the Jersey beach. Per Page Six, Sorrentino—who starred in six seasons of MTV’s The Jersey Shore from 2009 to 2012, and in the fevered, festering limbo of the American subconscious ever since—has been sentenced to eight months in prison for tax evasion, alongside his brother, Marc, who received two years. Specifically, “The Situation” is being cited for not paying taxes on the roughly $9 million he made from personal appearances during the show’s heyday, sometimes bringing in as much as $48,000 to show up at a nightclub, expose people to his powerful ab radiation, and then collect a check. (Or rather, collect a big bundle of safe, unreported cash.) Sorrentino—who appeared on this year’s revival series, Jersey Shore Family Vacation—pleaded guilty to the charges, but attempted to impress upon the judge that he’s changed his ways since his most aggressively bro-y days, stating that he’s given up alcohol and illegal substances, and now spends at least some of his time talking to high schoolers about how they shouldn’t do any of the things he became immensely wealthy and famous for doing.